This salad is bursting with Mexican flavors! Cook macaroni al dente, according to package directions. Drain and rinse under cold water. Set aside. Meanwhile, over medium heat, grill the corn on the cob, turning frequently, to brown some of the kernels. Remove from the grill, allow to cool, then use a sharp knife to cut the kernels off the cob. DRESSING: In a medium bowl, stir together all ingredients, until well combined. 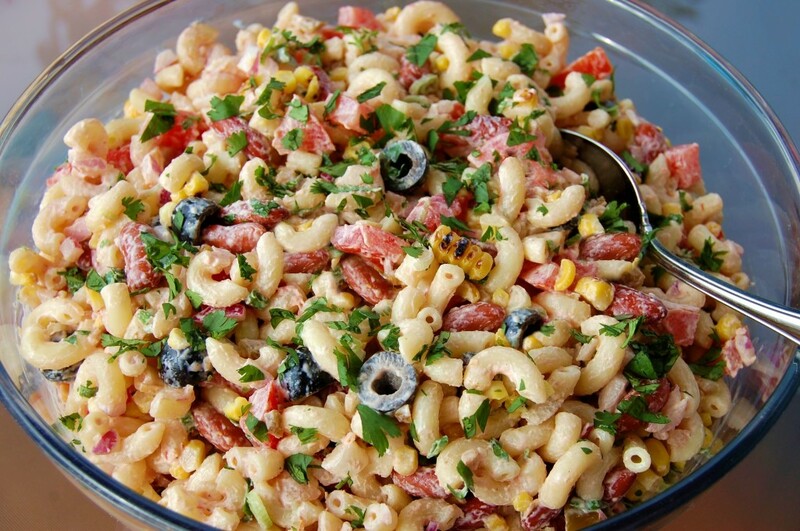 Assemble the salad: Place the cooked macaroni, corn, beans, olives, tomatoes, green onions, red onion, and cilantro (if using) in a large bowl. 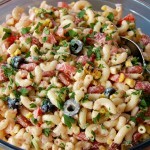 Pour 3/4 of the dressing over the top and gently toss until all the ingredients are coated. Add the final 1/4 of the dressing if you think it needs it. Cover and allow salad to chill for 2 hours. Garnish with cilantro.